Dan Staub, new manager, at front counter of Connect Now. 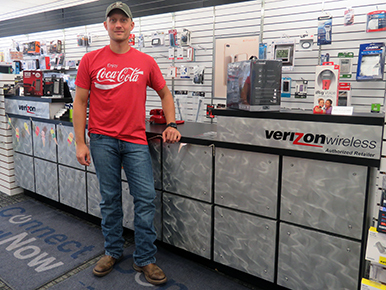 Albion native Dan Staub has always enjoyed helping others solve their problems—and as new manager at Connect Now, he intends to do just that. Staub began the position in May. In his new role, Staub will oversee the Verizon and retail side. He’ll also take on filtering any new employees. As it turns out, timing played a significant role in Staub’s decision to accept the position. Current owner of Connect Now, Amanda Redler, recently embarked on a new business endeavor and decided it was time to hire someone to fill in the managerial spot. Staub, who previously held a farrowing manager position at a hog unit for nearly 20 years, was also ready for a change. Prior to accepting his new position, Staub had been doing electronic repairs on the side through Connect Now. Staub, who is completely self taught, has been doing repairs for years.